1. We are working with money- it is a daily thing for us (on the calendar), but now we are really getting our hands on it- they are sorting and many are counting big handfuls already- thank you touch money! 2. There is a program coming up.....had to sing and dance today! 3. 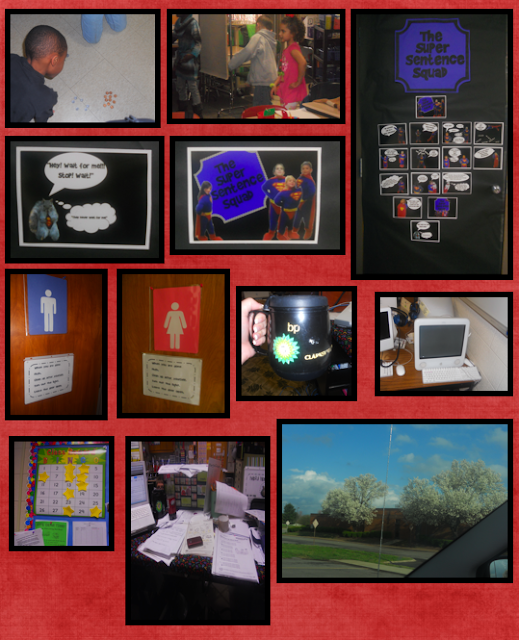 My current big project....the SUper Sentence Squad Comic Book Door! My youngest Little has the costume- I took it in and took lots of pics of everyone....later I Smart Scissored them and added the captions....they are great! 5. The look so super hero-ey. 6 and 7- Boys are icky- so my neighbor teacher and I separated the two bathrooms...the girls are super happy! The boys now realize how icky they are and have been taking a little better care of it. 8. My BP mug- even during the spill it was hard to walk with it in the hall ...but this puppy comes everyday- full to the brim with COFFEE!!!! 9. The "iMac at the end"....it is the bain of my existence.....works on the second Tuesday of each week.....if you know what I mean!! 10. Compliment Bingo....getting close to another one- a bingo is lunch in the room- everyone- and we watch looney tunes! and 12. This is what it looked like when I walked out of my classroom door today...I love when the wind blows because it looks like it is snowing....and my sweeties are mesmerized!!!! Have a great day tomorrow!!!!! I need to start on my grade cards. Not my favorite thing to do! Touch Money.......... hmmmmmmmmm.... I will have to look into this!! Thank you so much for joining up!! I love looking at everyone's pictures! They are great!!! What a cute blog! I love all the pictures! I have never heard of touch money - will have to look into that. Thank you for considering my blog worthy of an award. Although this “Thank you” message is arriving late, it is still sent with heartfelt gratitude! This award was particularly special coming from you, because your blog is one of my favorite in all of BlogLand. I'm honored! I gotta do grade cards this weekend!! I am done testing,just have to start thinking about those comments to write! !